A personalized hammer... what a perfect gift! Engraved with the name or sentiment of your choice, this hammer is a unique choice for a groomsmen gift, Father's Day gift or any other occasion that celebrates a special tool-lover. Please be sure to include the personalization of your choice (up to two lines) in your notes at checkout. 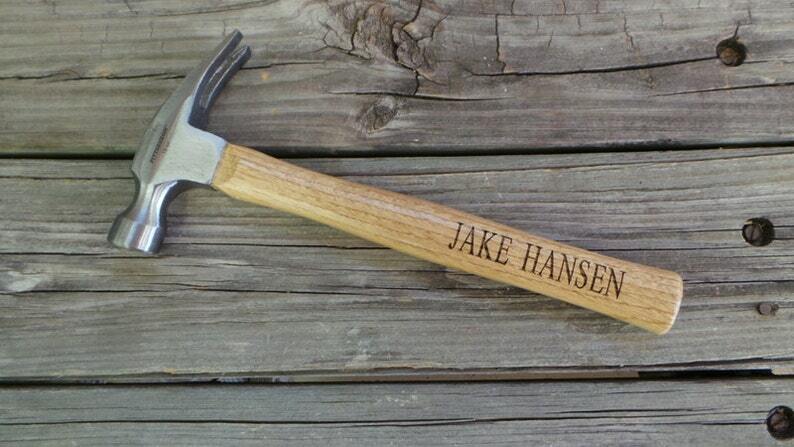 Engraved Wooden Handled Hammer - Personalized Hammer - Gift for the Groom - Valentine Gift - Gift for the Guy - You Nailed It! I bought this as a wedding gift for my hubby. It came out perfectly and he loved it. Great quality! Thanks!